CHICAGO, IL--(Marketwired - Jun 6, 2013) - Employees of BMO Harris Bank partnered with over 50 organizations in the Greater Chicagoland Area for their largest annual Employee Volunteer Day yet. During the week of June 3, over 1,500 Chicagoland employees took time away from their desk to volunteer at various nonprofits throughout their community. At Neighborhood Housing Services of Chicago, BMO Harris Bank President & CEO Mark Furlong and employee volunteers helped beautify the landscape, plant shrubs and paint the fence surrounding the NHS garden. 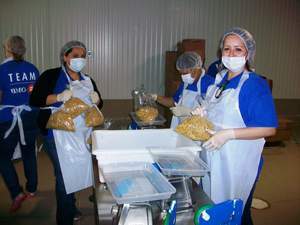 Volunteers worked at the Greater Chicago Food Depository, repacking donated bulk product to individual and family size portions, assembling boxes and labelling products. At Collins Academy, volunteers created an indoor mural and outdoor playground graphics. Volunteers visited with seniors at the Adult Wellness Center and read with the children of the Head State program. Volunteers assembled 4,000 Red Cross Comfort Kits alongside Chicago Bulls and Blackhawks mascots Benny the Bull and Tommy Hawk. "BMO Volunteer Day is something our employees look forward to every year, and now, with more projects than ever, our volunteers are able to make an even greater difference in the city of Chicago and across North America," said Wallace Harris, Jr., Regional President, BMO Harris Bank. Over 5,600 BMO employees participated in this year's North American-wide BMO Volunteer Day, initially started in 2001. BMO Harris employees repack donated food at the Greater Chicago Food Depository on June 5 as part of its company-wide Volunteer Day.